I wanted to say thanks again for the great work your team did with our wedding. We were so happy with how everything turned out on the day of the wedding. Working with you was truly inspiring and our planning session really reinvigorated us just when planning was starting to overwhelm us. We both love music and it meant so much to be able to feature so many of our favorite songs in the ceremony. We got so many compliments on the music and, as planned, there really was something for everyone. Putting together the perfect music really made the wedding feel uniquely our own and allowed us to also pay tribute to those that couldn't be there in a really personal way (something I wasn't sure we'd be able to do!). The music sounded lovely on the day. Thanks again for everything!" 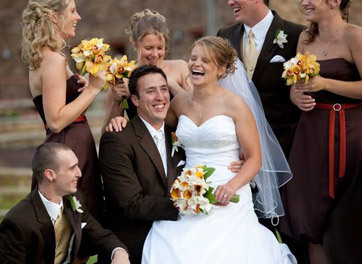 "Penn Strings was "WONDERFUL for our wedding. We had an outdoor ceremony and the music was beautiful. I called them based on finding them online. Since we live in Colorado and got married in Pennsylvania, we had to plan this part without meeting them until the day of event. They sent us a CD to listen to in order to help us pick what we wanted, and worked with us on the phone to customize the music to our liking! Then on the day of the wedding they appeared right when they were supposed to, played breathtaking music, and were just wonderful! I would HIGHLY recommend them to friends looking for strings for their ceremony -- just wonderful!!!!" 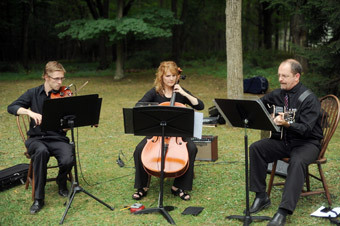 The musicians of Penn Strings performed live music for the Fetherolfs' outdoor wedding ceremony at the Bear Creek Mountain Resort in Macungie, PA.
"We cannot begin to thank the both of you enough for your amazing performance at our wedding ceremony. Your love of music is conveyed in each note you play, drawing your audience in to love it right along with you! Your performance was exactly what we dreamed our ceremony music to be, down to every last detail. We will always be grateful that you were were able to bring out the emotion we were feeling on our special day for our loved ones to hear!" 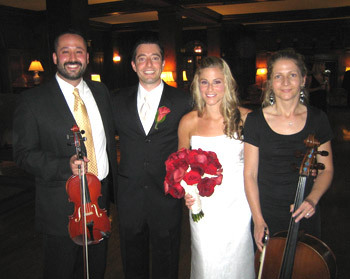 The professional wedding musicians of Penn Strings performed rock ballads such as "All I Want Is You" by U2 on cello and violin for the Zimmermans' contemporary wedding ceremony. 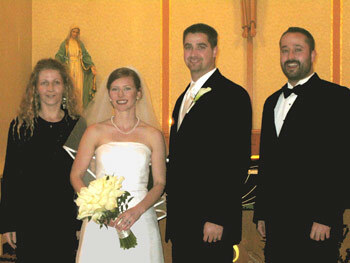 Lisa and Earl were married in the St. Rose of Lima Church in Carbondale, Pennsylvania. 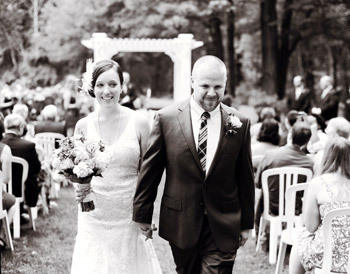 "The Pennsylvania String Ensemble played the ceremony music at our wedding, and we (and our guests) were very impressed with their performance! We are both music lovers and we were so excited about the contemporary pieces that Chris and Agnieszka played for the prelude. They were even kind enough to create a string arrangement for one of our favorite Goo Goo Dolls songs, which added a personal touch as the postlude for the ceremony. We were very honored that they arranged this song as a special request. Their music added such an elegant flair to our wedding, and was the perfect accompaniment to the mood and setting for the ceremony. 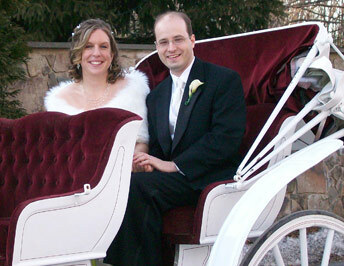 We highly recommend them for weddings or any other occasion and thank them very much for being a part of our wedding!" "You two are a pleasure to work with, and we fell in love with your music! We really enjoyed the sampling of music you played for us at your home ... I know I've said it before, but you could play anything and it would sound beautiful! Listening to your music while we were about to take that big step had everyone in the church on the verge of tears. It felt like we were in a fairytale. 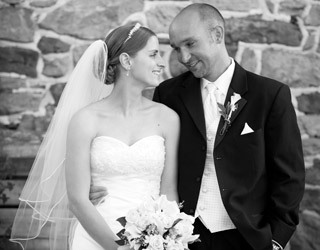 Thank you so much for giving our wedding the elegance and sophistication we dreamed it would have!" 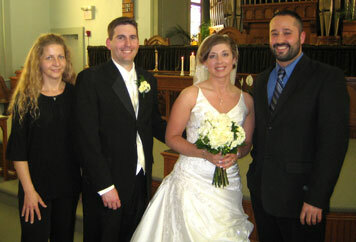 "We were honored to have Chris and Agnieszka of the Pennsylvania String Ensemble play at our wedding. They exceeded our expectations (which were already so high!) with their talent and professionalism. We especially loved how accommodating they were in learning a wide variety of contemporary music for us, as well as working on the spot to accompany our Rabbi, who sang during the ceremony. 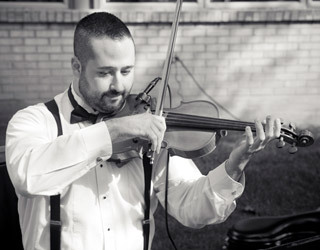 They made us feel comfortable from the day we first heard them play; we were immediately confident that they would bring both elegance and enjoyment to our wedding. Thank you for helping to make our wedding day even better than we ever could have imagined!!" In addition to providing live classical and contemporary music, the musicians of Penn Strings were graced with the opportunity to accompany esteemed cantor, David Wisnia, a Holocaust survivor and celebrated soloist. 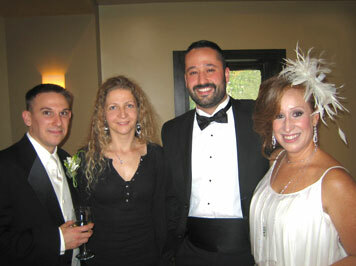 The wedding ceremony music echoed through the gardens of the Skytop Lodge in the Pocono Mountains. Thank you so much for doing beautiful work at our wedding! The music was absolutely all I had dreamed of. Thank you for helping make our day perfect!" 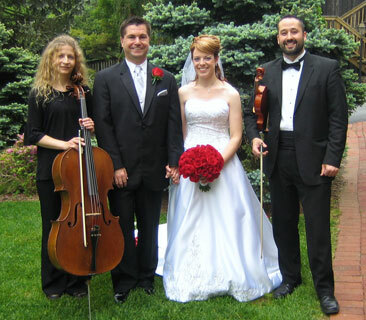 The wedding musicians of Penn Strings performed traditional and contemporay wedding music for the outdoor ceremony of Lauren Peters and Ryan Patrick. The ceremony was held beside the Delaware River at the Shawnee Inn in Shawnee-on-Delaware, Pennsylvania. Saying 'Thank you' doesn't even seem to cover the appreciation we feel for the music you provided for our wedding. Every aspect of working with you both was thoroughly enjoyable - from our initial contact, to meeting to select the music, to the final performance at the ceremony. We honestly could not have pictured our day being complete or perfect without your music. The first time we met, you could just feel the joy you both have for playing come through as you played. We especially loved that you played contemporary music along with the classics. We received countless guests' comments on how they loved the music you provided. Thank you from the bottom of our hearts, and we hope there is an event in the future for which we can use your talents!" Jaime & Seth featured the music of cello and violin for their wedding ceremony in the historic sanctuary of the Frenchtown Presbyterian Church in Frenchtown, New Jersey. "The music was wonderful ... You both looked so wonderful playing! Making the arrangements was a breeze, and your emails answering all my questions were prompt and so courteous. You added such a romantic touch to our daughter's wedding day. Thank you so much." 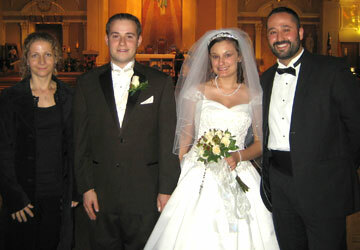 Violinist Chris Souza and cellist Agnieszka Rybska of Penn Strings performed elegant classical and traditional selections at the winter wedding of Andrea Borek and Todd Pederzani. Thank you for performing so wonderfully at our wedding at Iron Lakes. Our guests were very complimentary as well. We appreciate your flexibility with our late change to our exit music. We look forward to seeing our wedding video to hear what we missed. Thank you for meeting with us prior to the wedding for the private concert. We'll certainly recommend your services to others." Penn Strings provided prelude and ceremony music for the Schnecks' wedding celebration at the Iron Lakes Country Club in Allentown, PA. Adding a whimsical note to their ceremony, the Schnecks chose to walk away to "Supercalifragilisticexpialidocious" from Mary Poppins. Eric and I want to thank you so, so much for participating in our very special day. You two made it that much more amazing!!! We were extremely impressed when we first heard you at our private concert... we could not have imagined our wedding day without you. Our guests continued to talk about your 'beautiful,' 'phenomenal,' 'fabulous,' 'amazing,' 'fantastic' music ( their words ) for weeks after the event. Your extreme professionalism and kindness topped off how wonderful you both were to work with. We just can't say enough about you. I personally mention you at least once a day to someone. We wish you and Aggie great success; you definitely deserve it. We don't care what our next event is ( even a picnic in our backyard ); we would love for you to play. Sincere thanks and gratitude!" 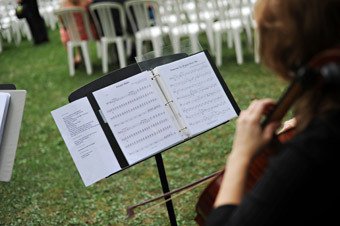 Penn Strings performed live, contemporary wedding music during the wedding ceremony of Hilerie and Eric Deutsch at the Lakehouse Inn in Perkasie, PA.